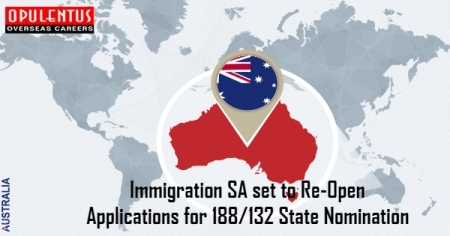 With effect from 7th June 2018, Immigration SA has made an announcement regarding re-opening the application system for applications seeking 188/132 State nomination. At present only few places are available. The availability of Application stands confirmed at the time of submission. In case a demand for payment exists it means that the candidate has secured a place in processing. As a proof by the potential applicants for State nomination, to commit to the cause of the state of South Australia, only the applicants, who previously visit South Australia, are eligible to apply seeking State nomination. Moreover they must offer a proof of this fact, at the time of the applying for State nomination. This will come into effect for such applications, which are submitted from 3PM on 7th June 2018 and later. The applicants, who could not get through in the present process of applications, also have the satisfaction that there will be more places available from July, when a new program- year begins. There are steps for the encouragement of new businessmen to the state to better their experience of export opportunities. The significant business history applicants will have more benefits from 1 July in the state requirements for exports. In order to meet the export requirements, the applicants with an age below 55 years, who do not access a regional concession, must export minimum AUD $600,000, worth of products and services in South Australia as turnover. Furthermore, it cannot be wine, when the total exports, are below $1 million.